Discussion in 'Online Casino Promotions' started by Marina, Oct 6, 2016. Rock your way to robust rewards in a new promotion offered by Betsafe Casino. Enter the Rocktober promotion and you could be on your way to some massive payouts. You’ll find some fantastic daily offers at Betsafe Casino in a promotion which is scheduled to run from today until October 25th 2016. A massive 500,000 free spins are being given away to lucky players during the promotion. In addition, you can enter a weekly €5,000 Rocktober Tournament and put yourself in line to win extra rewards. namely Jimi Hendrix Online VideoSlot , Guns ‘n Roses Video Slot and the newest of the lot, Motörhead Online Slot. then wager on the correct game. After that, you will enjoy free spins instantly! Check out the Daily Teaser at Betsafe Casino. Wager a further EUR 450 on the game and rock away with 10 SUPER Spins instantly. Tip: Even if you wager on the wrong game, you don’t need to worry. Betsafe Casino will still give you free spins if wager later the correct slot of the day. Whichever way you look at it, it’s a win-win! The Rocktober promotion also gives you the chance to enter weekly tournaments for the duration of the special offer. Put yourself in line to win more with the weekly €5,000 Rocktober Tournament on the three feature games, Jimi Hendrix, Guns ‘n Roses and Motorhead. Your first move is to play a minimum of 20 rounds at a minimum bet of EUR 0.20 per spin on any of the feature games in order to qualify. over any 20 consecutive spins, that’s the place you want to be because you could find yourself among the top players on the weekly leaderboard. 16th – 25th – EUR 25 BIG Spins. Each tournament will run from Tuesday to Monday during the promo period. Tournament winnings are paid out as bonuses the day after each tournament. 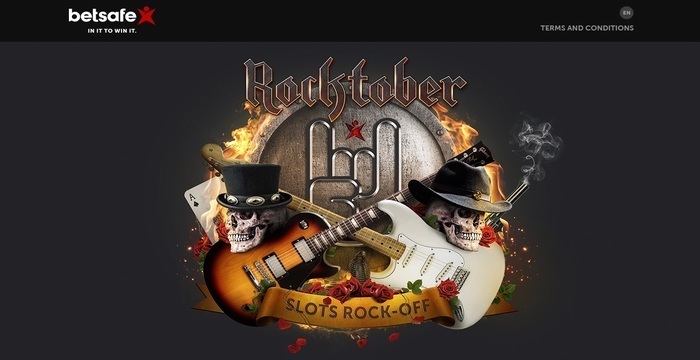 Good luck in the Rocktober Promotion at Betsafe Online Casino! Sounds great this Rocktober. I will join this promotion. This rock star plays guitar left-handed.